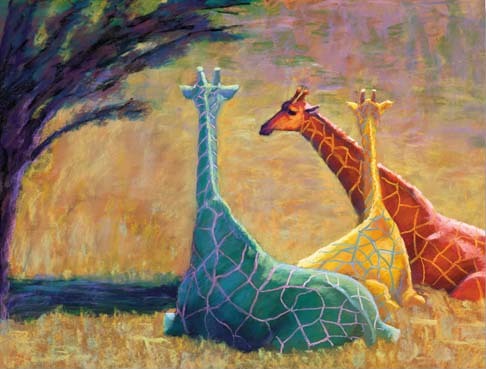 This painting of 3 giraffes, which is titled Party Animals, gave birth to the Party Animal series. It was taken from a photo by my husband at a wildlife animal park where giraffes are protected and feel safe enough to lie down. The composition (the intersecting heads and necks) was compelling but the repetitious tan and brown with more brown and tan left me snoozing at the easel. With no intention other that to energize the painting I chose to push the color over the edge. To my surprise the result was one of whimsy and left viewers clamoring for more.